Listened to my very first 2011 INDYCAR Teleconference Wednesday morning, (West Coast/Pacific Daylight Time Carpets; Oh Never Mind!) 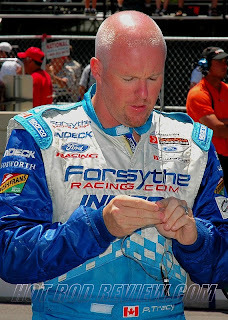 which was with Jay Penske and the irrepressible Paul Tracy... Regarding the official announcement of Dragon Racing’s running PT for five events this season, beginning at Long Beach. (This weekend, Meesh!) Then Texas, Toronto, Edmonton and Sonoma; while the Q&A session ranged on topics as diverse as Stephen Luczo and Gil de Ferran, TWIT-ER, Competitors, Sponsors, Team Makeup, Other Teams and the upcoming Canadian races, etc. Yet, when queried ‘bout his feverant twitter blasts – apparently slinging some mud towards JV (Jimmy Vasser, NOT Jacques Villeneuve...) and KV Racing Technology? (Since your humble scribe refuses to join the TWIT-ER nation...) he seemed to gloss over it. Tracy was quick to point out that the Ralph’s Grocery chain’s sponsorship was the same company that had sponsored Richie Hearn way back in the Good ‘Ol CART Dazes... As Ralph’s is a Californian company – along with his Motegi Wheels backing also having an office there, albeit I’m a bit cornfuzed over whether it’s Motegi Wheels or Motegi Racing and Wheels Pro – as I’ve seen all of the above scribbled on ze Internetz... AnyHoo, it sounds like Tracy and Penske Junior are doin’ a bit ‘O Californication, eh? Jay Penske eluded to how he’s still good friends with both Messer’s Luczo and De Ferran, saying that Luczo is one of his greatest friends, they’re involved in multiple business ventures, he’s Luczo’s sons Godfather and he expects to be partners with him into the foreseeable future. 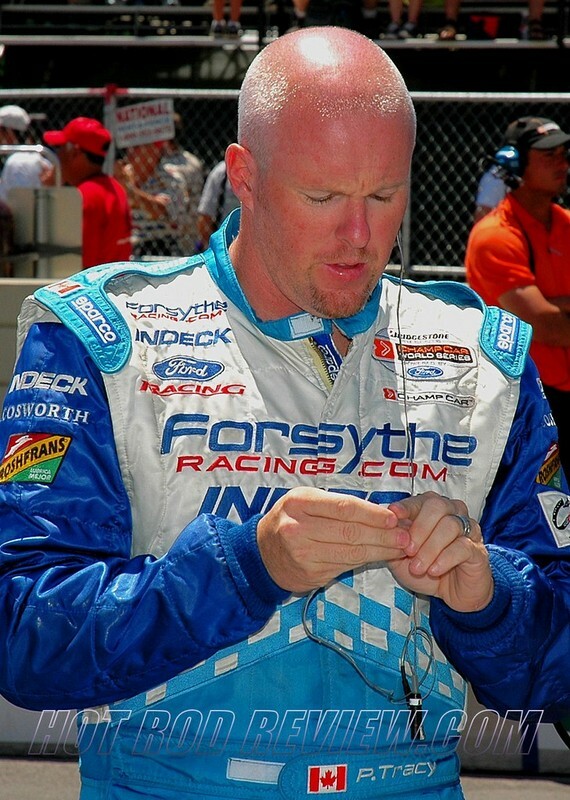 As for De Ferran, Jay echoed Simon Pagenaud’s earlier comments... As “Symone” said upon Autosport Radio: You never know ‘bout what gil’s got in his pocket – always working on a deal. As it sounds like both men think De Ferran will resurface somewhere in the near-term future. Asked about the Dreyer & Reinbold Indy “One-off” deal, Tracy said that at that time of the moment, he had nothing concrete for the season and Dennis Reinbold basically dropped the dealio into his lap – saying take it or leave-it. (As apparently Danny Boy “Spike” Wheldon was anxiously waiting in the wings...) And although Tracy was still hopeful of a full season ride, NO less with Jay Penske’s Dragon Racing, time was running short and they couldn’t force the sponsor’s hands, so he gladly accepted D & R’s I500 offer, which initially was to be his first race of the season. Jay eluded to the fact that they’ve got the cars and sponsors and are studying a small cadre of drivers to run at Indianapolis this year, so stay tuned for another really B-I-G announcement. As I’m assuming Y’all have heard the Sam “I AM” Hornish Jr. Scuttlebutt, eh? And when a ‘Kuhnadiun Hack asked if he was happy to pass off the baton for KuhNucks in Indy Cars or saw the Mayor ‘O Hinchtown (James Hinchcliffe) as competition... Tracy said he’s glad to have another KuhNuck on the grid; since I think the question was actually ‘bout there being a whopping three Canadian’s this year at Indy... But PT made it very clear Hinch is competition – as he AIN’T ready just yet to give way to the Young Lion; GOT THAT ‘HINCH? As for Honda of Canada sponsorship for the North of The Border events, Tracy said he’ll be doing a “Proper” media blitz in Oh KanaDuh shortly... As I’m assuming they’re may be some sorta Oh Canada branding on his, TAG’s (Alex Tagliani) and ‘Hinch’s (James Hinchcliffe) Dallara-Honda racecar’s shortly? As for the reconstituted IndyCar team and its make-up, Jay noted how Team Manager John Cummiskey has 21-years in the series, the team has 150-years experience overall and they were able to retain nearly 70% of the previous De Ferran Dragon Racing crew. Tracy noted how he’s reuniting with his ex-Forsythe Engineer Eric Zeto, who he’s won a couple of Long Beach races with, along with some ex-Penske Boyz, some he’s known for nearly 20yrs. Tracy also noted how he made his very first ‘BigCarz (CART) debut for Dale Coyne there, along with winning his first series race at The Beach and has four victories in total there, albeit I believe former Sparrin’ Pardner ‘lil Al (Unser Jr.) is King of the Beach with five wins to his credit! Asked why he’s not content to just “Pack-it-In” at 42yrs old, call it a day and just relax ‘N sit back on the couch watching the Boyz tear up equipment... Tracy quickly responded; I’ve got every type of Toy imaginable: ‘Scooters, (motorcycles) ATV’s, Sand Rails, Fast Cars, etc. and NONE of it fulfills my Need for Speed! Like an Indy Car does... Amen Brother! Give ‘em HELL this weekend Mr. Chrome Horn!